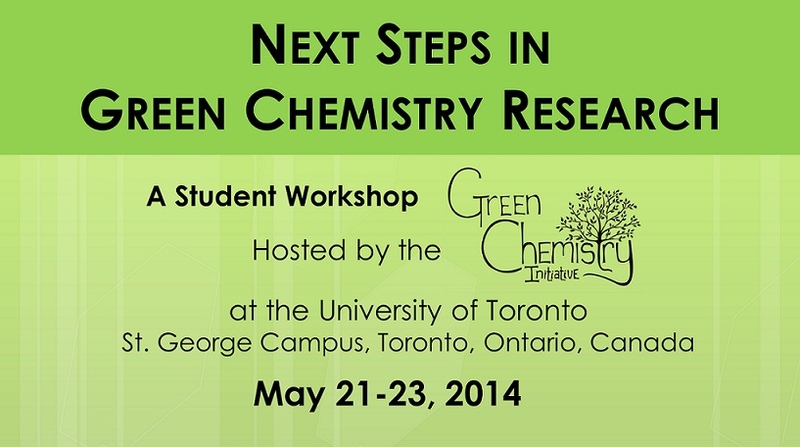 The second annual Green Chemistry Workshop organized by the Green Chemistry Initiative at the University of Toronto aims to teach participants practical information they can use to incorporate green chemistry into their own research and future careers. This workshop was designed by graduate students for graduate students (though all are welcome to attend!) and represents a summary of what we ourselves felt we needed to learn to move to the next level in our understanding of the principles and practice of green chemistry. Speakers from both academia and industry will discuss a wide variety of topics, from mechanistic toxicology to green process chemistry at an industrial scale. - An optional crash course in green chemistry fundamentals is offered on Wednesday, May 21st for those who would like a refresher on the basics. For more information on the event schedule and other details, see the official Workshop Schedule. - Dr. Cameron Cowden - Executive Director of Process Research, Merck & Co., Inc.
For more details please see the official Workshop Schedule. The cost of the workshop is $60 CAD for advanced registration (by March 28th 5pm) and $100 for regular registration (by April 30th 5pm). This cost includes lectures and catering and does not include accommodation and travel fees. The GCI in cooperation with our sponsors is proud to be able to offer a limited number of travel scholarships for participants visiting us from outside of Toronto. Download the application here Travel Scholarship Application Form and submit by March 14th, 2014 to gciworkshop2014@gmail.com for an award of up to $500, based on financial need and the quality of the application. Please use the subject 'travel scholarship application'. Participants are encouraged to bring posters showcasing their own research and get feedback from peers and invited expert speakers at the poster and networking session from 7:30 - 9:30 pm on Thursday, May 22nd, 2014. After you have registered via Eventbrite (non-department members) or at our office at LM 330 (department members), you will receive an e-mail with an information package as well as a poster registration link. The nearest accommodations can be found at New College residences at the University of Toronto St. George campus. The workshop starts at 5pm on Wednesday, May 21st and ends at 6pm on Friday, May 23rd, you are welcome to stay a few days over the weekend to explore the city of Toronto. Rates at New College are $41/night for singles and $58/night for doubles for up to 5 nights. Remember to book well ahead of time to ensure your spot! If you are flying Porter Airlines and decide to take public transit from the Toronto Island Airport (YTZ), catch the Porter shuttle which will drop you off at to the north-east corner of Front Street and York Street, then cross to the south side of Front Street and enter Union subway station. From there, take the University-Spadina line subway northbound to St. George subway station. University of Toronto maps can be found at สล็อต999. Help us promote the workshop! Please send our สล็อต999Workshop Poster to your friends and colleagues.